The plan was to go to Cragmaw Castle and finally deal with the villain, the Black Spider. Everyone agreed. It was how the session began. But then the past caught up with the wizard, and everything went sideways…. We began session #12 with nearly a full table, only the rogue was MIA. The PCs have just rescued the ashes of their ex-comrade from a small dungeon they fled weeks ago. The PCs abandoned the goblin follower when the paladin PC died. The paladin had taken the goblin prisoner in a previous session and was training him to be a squire. The paladin then died at the stalks of an invisible zombie beholder. When the beholder’s presence was detected but not identified, the paladin ran up to the unknown entity and swung his sword at it. The beholder rayed him. I rolled near max damage. The paladin failed his save. The holy warrior became a pile of dust. The rest of the party fled. However, they closed the secret door and trapped the goblin inside the room, not caring about his fate. But the room had a purpose. A prophecy declared a demon would be trapped until The Chosen One came along, powerful enough to finally kill it. The demon would be freed, the Chosen One would kill it, and the land would finally be safe. A magic pool was created. It would determine who the Chosen One would be when he/she came along. Everyone else just gets a random magic pool effect. The zombie beholder was placed there, invisible, to guard over the pool throughout the ages. Back to present. The goblin is stuck in this room. The beholder watches him. The goblin’s nerves calm down after a couple days and his panic lowers a bit. He drinks the pool’s water…. The goblin is deemed the Chosen One. His name is now G’garulhliiuirhan, or just Garg to his friends. Under the pool is a magic sword. A compartment opens, raising the sword while draining the magic waters out. The goblin now has an awesome demon-slaying sword. In addition, the beholder pledges service to the Chosen One. So the goblin has the creature disintegrate the door and both escape the room. Weeks after these events, the PCs journey back to the cave to get the paladin’s ashes and they encounter Garg. He’s riding the zombie beholder. The demon-slaying sword is at his hip. And he’s got two dretch demons collared and chained walking along in front. The party is floored. And scared of the goblin who’s been travelling the countryside on a mission as the Chosen One to find demons and slay them, and to ultimately find the trapped demon too powerful to kill 1000 years ago and slay that one too. The party parleys and offers to help Garg. The goblin says thanks, when the time is right. After more chit chat, Garg and Hobos part ways, but with quests to resume. The next morning, the party hops back onto the Triboar Trail and heads back to town. Upon reaching Phandalin, everyone splits up to buy, sell, and rest. The group also checks up on the Blue Diamond Coster, who have now finished their large, central building and are erecting homes and several smaller buildings now. And the Hobos also scout out Trescendar Manor, because locals report their old enemy has returned, The Red Brands. But the group killed all the Red Brands weeks ago. Somehow the gang is back and shaking down the local merchants and bullying townsfolk once more though, and fingers point to the Manor as their lair again. So the group splits up. Some PCs approach the Manor from the forest side. One walks up main road to the front of the ruins. And Six the wizard hangs out at the nearby tavern. A lookout spies Belenos the Lathander monk and opens fire. This fails to rouse the Hobos though, as they just duck for cover and continue to scout and creep about. Learning it’s just a lone scout defending the ruins, the party converges. And that’s when the riot happens. It turns out Six was busy in the tavern. Fomenting dissent against the Red Brands, he gets a few dozen miners drunk and angry. They sharpen their shovels, murder in their eyes. Six says, “When you see a big fire light the sky, storm the Manor!” and shovels and mugs pound in assent. The riot begins. Miners pour out the tavern and march up the road, unbeknownst to the other party members. The party licks its wounds and decides to tackle the Red Brands another day. Six runs to the road and intercepts the shovel-wielding drunken miners spoiling for a fight, spoiling for the end of tyranny, and says the assault has been called off. The miners are disbelieving and angry. Several start fighting each other. The wizard is forced to offer more free drinks back at the tavern to quell the riot and turn it around. The next morning the Hobos sneak out of town and finally head to Cragmaw. Two days pass uneventfully. On the third day, nearing the castle, Six’s familiar spots the place where Six was “born”. When the party found the wizard Six weeks ago, the wizard had just woken in a fire-blasted hole in the ground. With only fragments of memory telling him he’d just escaped something terrible, the mage limped out of the wilderness and headed to the nearest town. In Phandalin he met the PCs and decided to join their quest to defeat evil in the region. Six knows he was part of an evil experiment and recruited and trained as a minion in a death squad. He fears what he’ll remember next. When the owl Ash tells his master the blast hole is nearby, Six wants to investigate and look for more clues that might help him regain more of his memory. The PCs follow along. Soon, the party finds the site of the explosion. Trees have been blasted to stumps. Large rocks were thrust away, leaving long gashes in the earth. In the middle of the blast zone is a pit. Surrounding the pit are burnt bodies of several people. And feasting on the BBQ are two collared hellhounds who turn their burning red eyes and furnace hot maws towards the Hobos. Hellhounds and warriors clash, with magic artillery firing in from the back ranks. The dogs breathe and Hobos go up in flames. The dogs bite and Hobos yelp in pain. The dogs howl and Hobos roar back. Then the dirt in the pit stirs. An armoured limb thrusts out of the blasted earth. Then an armoured helm. Soon a whole creature stands, eyes glowing with malice and plate mailed limbs infused with magic. The creature leaps into the air and flies above the raging barbarian and warrior and attacks from above with its greatsword. The party frantically attacks back, but to its dismay another foe joins the fray. As Malchor smacks the helmed horror, who seems to be immune to most of the party’s attacks, a translucent being flies out the helm and forms a chilling presence above the fight. The ghost coalesces from the ethereal plane and starts attacking. But striking fear into the Hobos’ hearts more than the fact four foes now face the Phandalin forces is the ghost looks like Six the wizard! What trickery is this that an ethereal Six should attack the party? The Hobos fight on and Six targets the ghost. Ghost Six turns to Wizard Six and speaks. “Break the chain” it wails. “Break the chain!” With that, the ghost tries to possess the barbarian. But the outlander resists the attack and dances away. Soon both hellhounds go down. The ghost fails to possess the warrior. The helmed horror continues its relentless attacks from the air. Hobos drop. Then the ghost takes massive damage and flies away, escaping the battle. Spells bounce off the horror, as do mundane weapons the Hobos brandish. Vargulf the druid turns the barbarian’s sword into a magic weapon, and that turns the tide of battle. The horror is whittled away until it falls to the ground, lifeless, nothing but a pile of magical treasure for the badly wounded party. We end the session there, Cragmaw Castle denied once again from a visit from your friendly neighborhood Murder Hobos. Six reveals what he knows of his past to the party. And the group pieces together some of what happened at the blast site. Licking its wounds, the group is pleased to finally find some magic treasure. The helmed horror’s plate mail and sword are magic. And so was one of the hellhound’s collars. We call it a night, the players promising me yet again they’d be assaulting Cragmaw at the start of next session. But with Murder Hobos at the helm, does their plan stand a ghost of a chance? We’ll find out in Session 13 of the Murder Hobos of Phandalin. Have a great week and try to get some gaming done yourself! This article was inspired by the use of combat zones in the Fate role playing system by Evil Hat Publishing. A lot of role playing games make use of tactical grid maps and miniatures in their combat systems. However, this isn’t the only way to run things. If you’re looking for a change of pace, then consider ditching the grid and running your combats without maps. It might be a bit challenging at first, but it will result in a more free-flowing, cinematic gaming experience. In this article I give you one method of running mapless combat. Follow the four steps below to represent encounters without the complexity of tactical maps. A zone map is a general representation of the encounter area, split into discrete sections so the GM can track where everyone is and who they can easily interact with, without the complexity of a full tactical map. To create a zone map, work out what areas you want to include in your encounter and how fast you want players to be able to move through it. In a normal game turn, players can move one zone and take a normal action. So the more zones you split an encounter into, the longer it will take to move through. Write a name for each zone on an index card (or drawn them on a document). Then place them down in the order you want them to appear in your game. PCs can normally just move between adjacent zones, so keep this in mind. PCs can also just interact with people in the same zone, although if they have long ranged weapons, spells, and other options it is dramatically appropriate they be able to attack someone in an adjacent zone. Using the zone map allows you to zoom in and out, controlling the pace of your game. Do you want a simple map that allows the players to cover a large area fast? Or do you want to zoom in and split a single building into multiple zones? Players’ positions on the zone map can be either written on or tracked with whatever counters you have on hand. Without props to rely on, description is more important than ever. Each time PCs enter a new zone, describe at least three elements of the scene that can be interacted with during the scene. If you need inspiration for descriptions, roll or choose items from the following tables to help create elements. Once created, work these things into the scene so it makes sense to the players. For example, the players walk along the northern road to the tower. I roll 3D10 and get a 3, 1, and 2 when I create my first description. This tells me there are some crumbling wooden crates on the road. Perhaps a merchant caravan was abandoned here after an attack by bandits and the crates (now stripped of valuables) still lie beside the road. Or maybe an impoverished merchant who is down on his luck seeks to avoid the heavy taxes of the town by selling his goods directly to travellers from a collection of crates at the side of the road. To encourage player interaction with the scenery, in any round where the players do not use the scenery in some way have your NPCs do so. For example: the players are poking around on the northern road when some bandits attack, seeking to use the old wooden crates as cover while they fire crossbows at the PCs. Keep things moving and ensure encounters are dramatic. Do this by asking players what their goals are in a scene as soon as you finish describing the area. This helps players keep their aims in mind, and give you a guideline to how to play your NPCs. 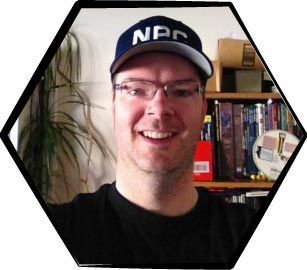 Next, decide the goals of any opposing NPCs or hazards in the scene and make them obvious to players so consequences of defeat in a scene are clear. Keep in mind not all NPCs will fight to the death and might surrender or flee if defeated. This prevents combats dragging on and is also an extra way to add more plot (perhaps if the bandits are defeated they will give up their employer). Mapless combat frees you up from concerns about movement rates and combat ranges to focus on your narration. To handle this best, assume if something is dramatic and it makes sense within the game then it can be done. However, you need to be careful players don’t attempt to hog the spotlight or do too much in a single round, or you might find other players feeling bored and left out. I also rule that players can take one significant action. Once a move and action are done, move onto another player. “I jump over the crates and swing my sword at the bandits.” This is fine since jumping the crates has no real game effect, so the player character is effectively just making an attack action. “I fire my own crossbow at the bandits.” This is okay since the PC is just attacking. “I ignore their fire and run down the path to the tower.” This is fine since the PC is making a single move action into an adjacent zone. “I run up to the crates, hack one of the bandits down with my sword, grab his crossbow and unload it into the others.” This would probably be too much since it involves more than one attack action. If a player said they wanted to do this, I would have them make their initial sword attack then move onto the other players, coming back to him in the next round. “I run back down the northern road and into the town.” This is also a bit too much since the PC proposes moving more than a single zone. As with the example above, I would move them one zone, then ask them if they were doing anything while running. I would then jump to the other players and pick up with him next round. Do You Have Any Mapless Tips? Following the steps above should allow you to run a dramatic and exciting combat tactical maps. Just use small zone map that are simple to create and administer. Gridless combats will be a lot looser than combats involving miniatures and battlemats, will be more narrative, and should help to keep things to the point and exciting without getting bogged down in unnecessary detail. Still, switching to mapless combat is challenging for same players. Do you have any additional tips on how to do this? Just hit reply and share your tips and advice with Johnn. Thanks. It’s too easy to think of classes just as things we tack onto characters to help them be better at going into dungeons and beating up monsters. What’s harder is to remember classes serve a purpose in fantasy medieval society, and we can leverage that social purpose to make our games more consistent and interactive. For every Bard that delves dungeons there are two or three or twenty that stick to taverns, work as street performances, or engage in acts of charlatanism. For every Wizard that travels the world righting wrongs there are many that hang out in towers, run apothecaries, and make ends meet by peddling minor magical items. If your party wanders into a smaller town lacking NPCs with heroic classes, why shouldn’t they be called upon to perform those pedestrian duties of their class? Why shouldn’t a traveling Fighter be asked to instruct a lesson at the local barracks, for instance? A DM should know the roles, expectations, and perceptions of a given class in their world. And since PCs (mostly) wear uniforms that identify them by their class, they should be approached to perform duties befitting their role in society. So what can we do as GMs to give the role of classes a stronger presence in our games? The method by which classes are gained creates a framework for how those classes interact with society in your world. Start with your PC classes and work your way out from there. Determine how characters come to their class. Where possible, involve your players and give them agency to define their character’s origins. Ensure there is conflict built into each class, such as rivalries, stigmas, bigotries, or agendas. What are they like? How prestigious are they? What are their specialties? Who runs them? What is their alignment and what are their goals? What rivalries exist between schools? How serious are they? A Bard’s guild is exorbitantly driving up prices for pub performances. A cadre of local Good-aligned Clerics refuses healing in the town until the Mayor banishes a Lawful Evil priest who’s been doing missionary work in the neighbourhood. A visiting, arrogant Monk is challenging all the local masters to prove the Iron Fang Style is the strongest. Characters may want to petition for membership (which should have some reasonable perks), may need something only the professional society knows, or may simply want to do heroic work for them. Is there a wizard with two apprentices who hate each other so much they want their opponent “taken care of”? Is there a rival martial academy (to one of the PCs) that is voraciously recruiting? Is there a teenager that just manifested sorcerous powers who’s scared and confused and just needs another Sorcerer (PC) to talk to? Scarcity is a wonderful tool to drive action in your game. If there isn’t enough of something then people want it. Get inspired by the world you’ve created. Start by looking at a map and circling all the cool stuff. Look for scarce resources with unusual properties worth fighting over. Once you’ve isolated what makes your setting unique, build class-specific duties and organizations surrounding it. If your world has a magical reagent that’s required for making magic items, create an organization of wizards responsible for mining it, protecting it, or for making sure that they sell impure versions of it at an unfair price. If your world has a massive chasm to the realms below, create a Ranger Guild that prides themselves on its exploration, or protecting people from getting too close to it. If your world has a tall mountain, create a grand master Monk who lives on it who only accepts students that can reach him. In addition to scarce resources, also pay attention to classes under-represented in an area. If there is a deficiency of Wizards in a town and suddenly a wandering wizard arrives, their services are going to be fiercely desired. That’s just supply and demand. Perhaps no one has been married for over a year because the local priest died. Perhaps the tavern suffers because there’s been no Bard to get people through the front door. Perhaps the town lives in fear because the sheriff, the only Fighter in town, was driven out by bandits. Alternatively, there might be a surplus of a class in a town. If a particular professional society is well-off in a town full of the not-so-affluent, it’s easy for a class to be disliked, mistreated, or even feared as a result. At the least, a PC might be dismissed because they’re nothing special. I get a lot of enjoyment in surprising my players by having their characters treated unusually. Last, when you build a history for your town, don’t forget to include an anecdote or two relating to different classes. If something of note happened, it’s easy for prejudice to live on. Maybe it was something a member of a professional society did. Maybe it was something they didn’t do. Maybe a PC is considered heroic just because of their class (we all loved “Jaynestown”, right? ), or they could just as easily be chased out of town. We can express these events in our game by adding monuments, favourite songs, holidays, or feasts in their honour.